Grand Central Publishing, 9780446535786, 352pp. 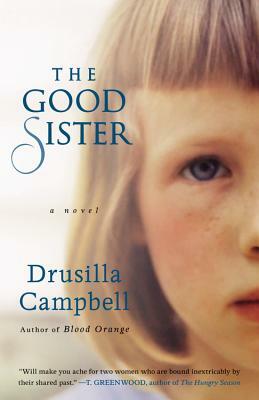 Drusilla Campbell is the author of three critically acclaimed novels: Wildwood, The Edge of Sky, and Blood Orange. Before she started school she had crossed the Pacific Ocean three times. In her twenties she lived in Europe and Central America. Today she's happy to stay at home in San Diego with her husband, the attorney and poet Art Campbell, two rescued dogs, and three horses. Many themes run through The Good Sister. One of these is codependency, the kind of unhealthy relationship that can tie friends and family together in knots of emotional misery. In large part The Good Sister is about Roxanne’s attempts to establish an independent life apart from her sister. Why is this so difficult for her? What obstacles real and imagined stand between her and this goal? Roxanne loves her sister and feels responsible for her, and Simone is excessively dependent upon Roxanne. Is Roxanne dependent upon Simone? In what ways? What events from each of their childhoods led to this enmeshed relationship? When and by what means might it have been terminated much earlier in their lives? Why didn’t that happen? Although she feels her mother abandoned her by leaving her with Gran, Roxanne has many happy memories around the three years she spent at the ranch. It has been said that our memories both sustain and burden us. How is this true in Roxanne’s case? The Good Sister is the story of four generations of women, each of whom has been abandoned in some way. How does the theme of abandonment run through the story and influence the lives of the characters? Merell slips into and out of rooms like a little ghost, unseen by the adults around her who are too much involved in their own lives. Roxanne was unseen by her mother except in her role of caretaker. Simone is slipping from depression into psychosis and Merell believes she is the only one who sees her mother’s pain.Is it true that we often do not see clearly the people closest and most important to us? Why is that? There are two “good sisters” in this book: Roxanne and Merell. How does Merell’s development mirror Roxanne’s? How do we see the pattern of behavior playing out in Merell in contrast to Roxanne? Do you think there is often one sibling who does everything possible to make the family happy and peaceful? If you were in Roxanne’s shoes, would you have stopped your life to help your sister in need? Elizabeth believes that we sometimes serve as “angels” to the people who need us. Have you ever known this to be true? Roxanne knows that without Elizabeth’s friendship she might never have found the courage to move away from home and take the first steps toward an independent life. Was it Elizabeth’s example that enabled Roxanne or something else? Is it possible that we look for in friends those qualities we know or sense are lacking in ourselves? While postpartum depression is quite common, postpartum psychosis is – blessedly – rare and does not occur in women who are not psychologically damaged in some way. Dr. Balch says in her testimony that in Simone’s case, a “perfect storm” of factors were involved. What were those? And does knowing why Simone tried to kill her children help you to feel sympathetically toward her? Did reading The Good Sister make you think of real mothers in the news who endangered or killed their children because of postpartum depression, such as Andrea Yates? Do you feel sympathy towards them, or do you see them as monsters? Do you think the media treats these women fairly? Do you think there is still a stigma against women suffering from postpartum depression in society? Simone is torn between her fear of life and her longing to regain the feeling she had when she sailed aboard the Oriole. How do these conflicting desires play out on the day she decides to take her daughters to the marina on Shelter Island? We apply the adjective good to being a mother and sister. What does it mean to be a good mother, a good sister? Johnny thought Simone would be a good wife. What caused him to make this egregious misjudgment? Is it possible that with no children or perhaps only Merell, Simone might have lived up to his expectation? Throughout the book Roxanne represses her anger, but in the final chapter Simone’s psychiatrist tells her it is time for her to be brave. What does he mean? What does he want Roxanne to do, why is this difficult and why does he believe it will help Simone? Will this family ever be whole again? What forces work in its favor and what pulls against it?